I haven't posted anything in awhile because my crafting urges have taken me away from beading lately. I've taught myself to knit, which is more portable than beading. After knitting a hat using Robyn Wade's Hemlock Flower Tam pattern, I looked around her blog a bit and noticed she had a list of 40 things to do before 40 that she updates periodically with completions and new additions. I've started my own list. The list items are placed in the order that they occur to me, which may or may not correlate to their importance. 2. Publish an article (academic). 3. 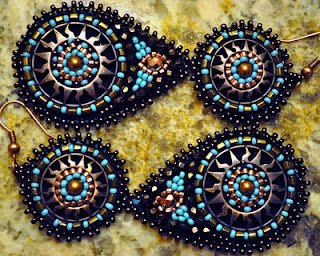 Enter my beadwork in a competition or show. 5. Start a retirement savings account. 7. Build a piece of furniture from scratch. 8. Get a tubal ligation. 9. Publish a pattern in a magazine (any craft). 10. Learn and acquire equipment to pressure can. 11. Take a road trip across the country. 12. Learn to spin using a drop spindle. 13. Learn to spin using a spinning wheel. 14. Learn how to make lampwork beads. 15. Knit a wedding ring shawl. I splurged on seed beads for my birthday. Miko is overseeing the unpacking process. I'm getting started on my January piece for the 2010 Bead Journal Project. I have finally decided on a theme: circles. My pieces are going to be circular in shape, roughly 5 inches in diameter. The interior design will vary, but will continue the circle theme. I'm drawing inspiration from Buddhist mandala designs and crop circles. Health issues have kept me from beading for awhile. These are earrings I made for my sister for Christmas. Techniques used include brick stitch and various bead embroidery stitches. I'm currently working on the 2010 Bead Journal Project. I'm a grad student who uses various crafts for stress relief.